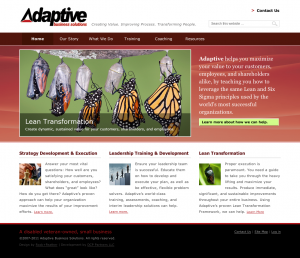 We’re very happy to announce the release of a new site for Adaptive Business Solutions. The site was done in partnership with Nicole Bratt of Rock+Feather Creative in San Francisco. Nicole is a gifted graphics designer and has created another fantastic site, which is built on WordPress 3.x and the Genesis Framework. The team at Adaptive specialize in helping companies maximize value by teaching them how to leverage Lean and Six Sigma principles. Please stop by the site and have a look around. In addition to doing the development and implementation of the site, Adaptive has selected DCP Partners to provide fully-managed hosting services.